Every so often as you travel you encounter an unusual village or community in a strange place. But the charm and uniqueness of these obscure locations is exactly what makes them so intriguing for travellers to visit. One of the most visually stunning of these is the village of Turda in Romania. It is home to an enormous salt mine that the Romans began excavating in 2AD. It continued being used until the early part of the 20th century when it was abandoned, having had more than three billion tons of salt extracted. In 1992 it reopened completely transformed as a recreation complex complete with health spa. Now it is mecca for halotherapy (a treatment for allergies and asthma that uses salt) and the most unusual theme park in the world. You head down over 100m before reaching the submerged wonderland. 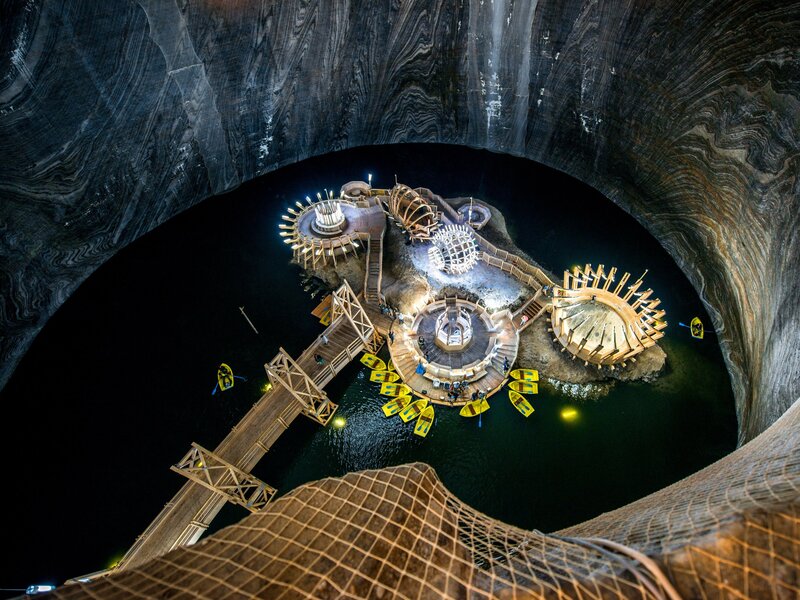 Once inside, you’ll find an amphitheatre, a bowling alley, an underground lake with paddle and row boats, and even a Ferris wheel. You can also play a round of miniature golf if you can avoid being distracted by the stunning rugged caverns. It’s not always the location that is out of the ordinary – sometimes it’s the traditions and the people themselves. Imagine your surprise as you wander through the lush scenery of southern Brazil only to come across a beautiful German village. Pomerode in Santa Catarina State was founder by German settlers in the 19th century and fiercely protects its heritage. The streets are cobbled, the tourist office is in a brick tower and the sports field is proudly named Hermann Weege Stadium – not your usual Brazilian name. All around you is the sound of German being spoken and the aroma of bratwurst grilling. If you time your visit correctly, you can even raise a stein or two celebrating Oktoberfest. Occasionally it is necessity that drives the creation of these bizarre and wonderful places. Coober Pedy in Australia is the centre of the world’s opal industry but also in the midst of a desert where daytime temperatures can soar above 40°C. The ingenious miners have overcome this with sheer ingenuity by turning the old abandoned mines into underground homes as these remain naturally cool. But they didn’t stop there. The homes proved so successful that the much of the town moved underground. Now you can find three churches, a bookstore, an art gallery, a bar, and hotels complete with swimming pools hidden beneath the desert sand. Contact us to visit more of these unique and incredible places that have to be seen to be believed.